One of the reasons the blog has been so quiet recently is that I was up in Overland Park helping with the National Association of County Agriculture Agents annual conference. We always have tours as part of the conference, and I helped organize and lead an Urban Agriculture tour. 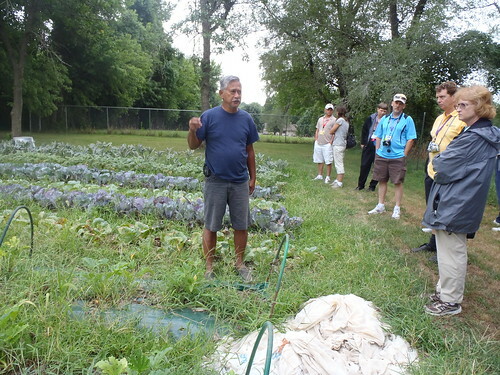 We visited the Kansas City Community Gardens, a couple of different farms, and the New Roots for Refugees Juniper Gardens Training Farm. The summer has been hot up there, but as you will be able to see from the numbers of tomatoes, not as bad as it has been here. 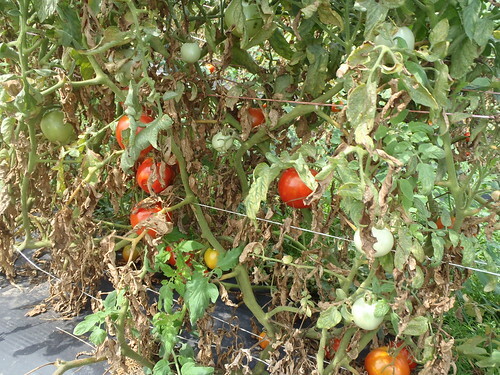 Most of the tomato plants we saw looked much sadder – diseased, spider mite laden, etc than most of our plants here. However, the striking difference was all those red things hanging from the plants. Yes, those are real, ripe-on-the-plant tomatoes. They do exist! I’d trade my relatively healthy plants for the plants with tomatoes on them, wouldn’t you? This urban farm is JJ Farm, and the owner, John Kaihua. He farms on 1 1/2 acres of backyards, and sells his produce through a CSA and a small farmers market. He had beautiful, huge red bell peppers of which I was very jealous! It’s pretty cool what you can do with some backyard space. This is part of the Juniper Gardens Training Farm and the New Roots for Refugees program. You can see one of the women watering her plot. 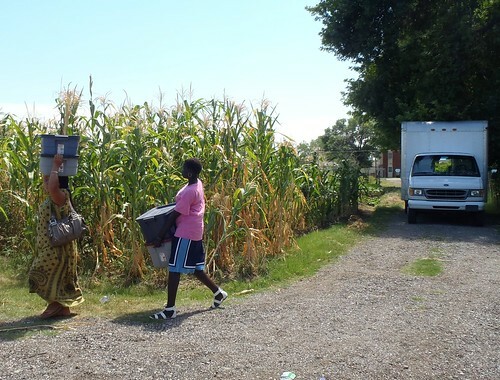 Each woman gets a 1/4 acre plot and assistance with seeds & plants, water, gardening, English, and business skills, and then sells the produce at a local farmers market. Over 4 years, the women transition to more independence and ultimately their own small urban farms, using the skills they have gained. Here are a couple of the women unloading after a farmers market. We visited a small farm at the Andrew Drumm Institute. 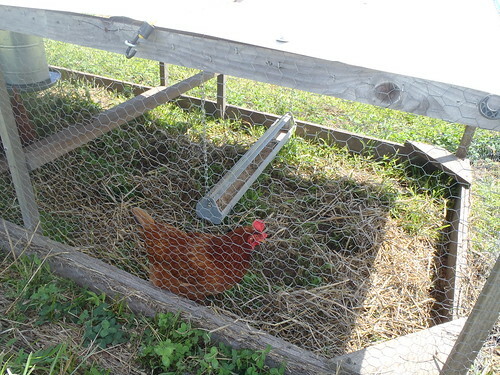 They had this homemade chicken tractor in one of the fallow fields on the farm. This is the raised bed section of the Kansas City Community Garden. Each raised bed can be rented be an individual or family, and all the plots at this garden are on a sliding fee scale, based on income. The raised beds are in areas where the soil is too clay or the drainage too poor for other gardening. 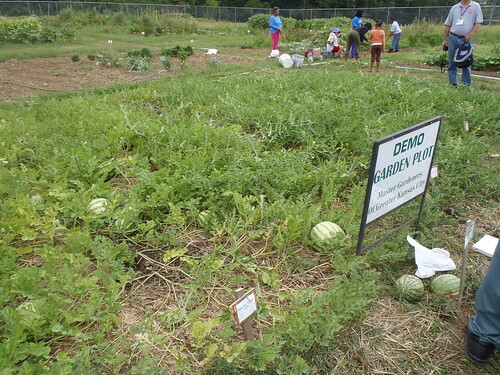 The Kansas City Community Gardens also have a Children’s garden with lots of different types of plants for education. 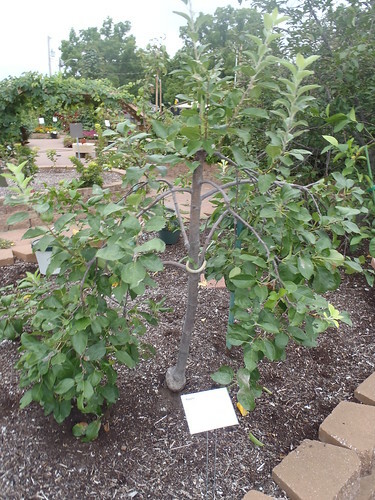 This is a dwarf apple tree in the Children’s Garden. One of the Master Gardeners was at the garden the morning we visited, and he was kind enough to pick a few watermelons from their demonstration plot at the garden and let us sample. Some of them were definitely better than others. Unfortunately, I can’t remember the name of the really good one. 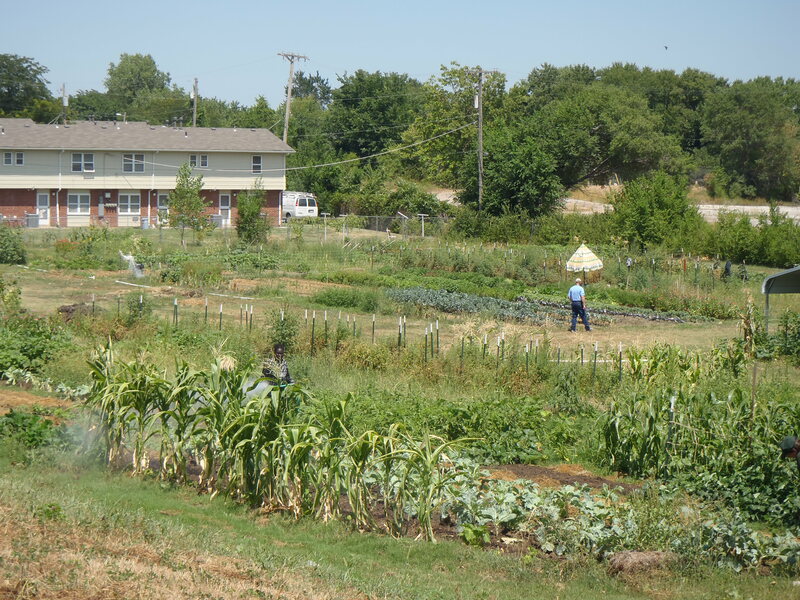 Last, but not least, we visited the Gibbs Road Community Farm with the Cultivate Kansas City organization. This is a very intensive small farm in Kansas City, Kansas, where they train apprentices in small-scale organic farming. 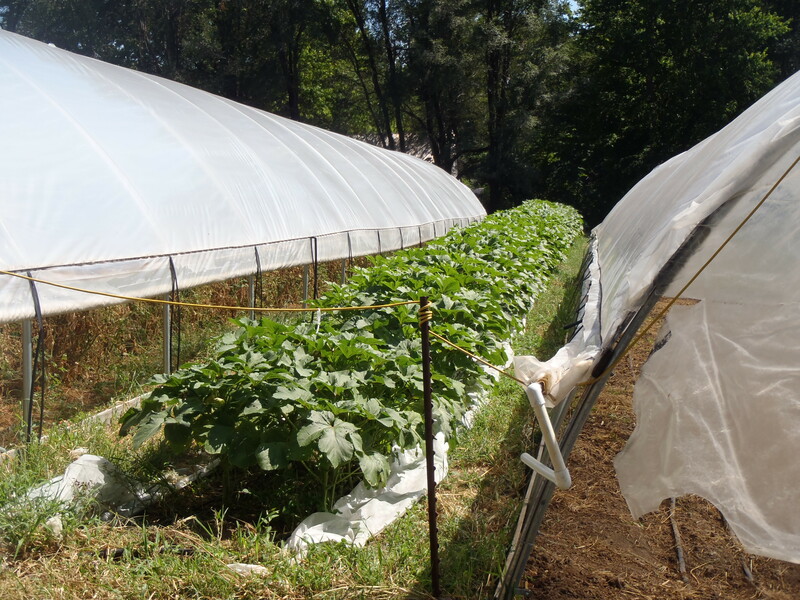 You can see the intensity with the row of squash between two high tunnels! Either tomorrow or Wednesday, I hope to get another post up about things I was up to in the past couple weeks. Posted on August 22, 2011, in Around the Garden and tagged apples, chickens, community gardens, farmers market, fruit, gardening, local food, Tomatoes, watermelon. Bookmark the permalink. 4 Comments. Wow, I had no idea there was so much Urban Ag in Kansas City. Thanks for sharing!! This is only a tiny snapshot. KC beats Wichita hands-down in urban ag!